Here we are in a post-WDW Marathon apocalyptic wasteland. At least you get to take a lot of rest days there. Workout log, show the nice people. I had planned to take a ballet class, but an impending ice storm compelled me to stay home. Just as well; I was pretty tired anyway. ... because I was off to NYC for a conference. I have the spirit of a real New Yorker, and I know this because IF ONE MORE DAWDLING TOURIST COMES TO A SLIDING STOP IN FRONT OF ME IN TIME SQUARE I WILL END THEM. This was the day Pat took me to see The Lion King on Broadway and it was AMAAAAAZING. More on that to come! In which I learned I am afraid of the subway. TOO MANY CHOICES. Where I am from, there are only 6 Metro lines and it doesn't matter because they're all on fire or something anyway. Before my Tuesday ballet class I was randomly chatting with a fellow dancer about my marathon. 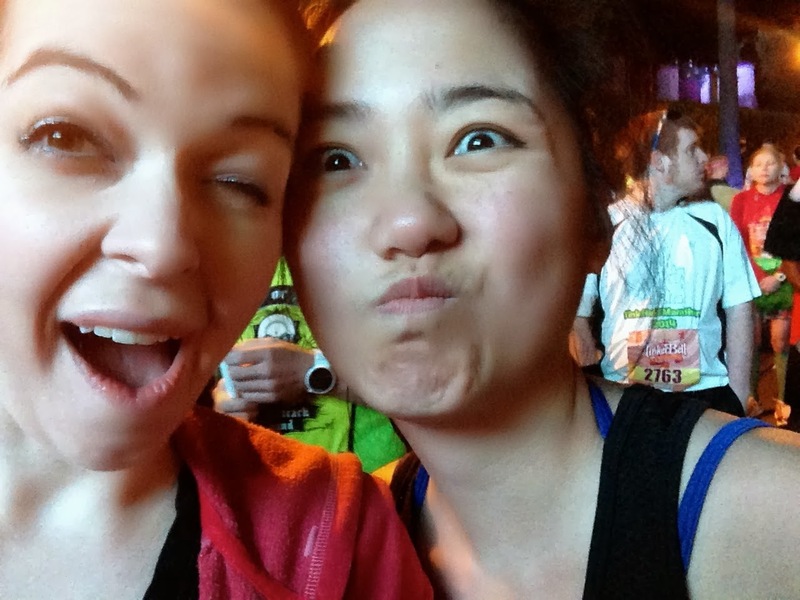 Another dancer overheard and expressed interest in potentially running a runDisney race! So of course I sent her a whole long-winded email about it; despite that she still seems potentially on board. Which is awesome - more runDisney friends! Awww, remember when Moon was here? Those were the days. - Half Crazy Mama rounds up the finest in cold weather running gear. - Elbowglitter got to attend the WDW Marathon Weekend Cigna blogger meetup. - The Main Street Gazette considers some IPs Disney has overlooked in its parks. - Disney In Your Day tracks down all the mac and cheese Disney has to offer. - WDW for Grownups eats the best breakfasts in WDW. - Disney Nerds digs up a Walt Disney cookbook. - As per usual, easyWDW reviews every single item available at this year's Epcot Festival of the Arts and as per usual I'll try one of every single thing, kthxbai.